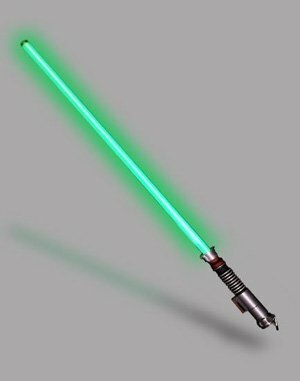 Rare Luke Skywalker Green Lightsaber! Conveniently Does Not Actually Cut Off Hands! "Jedis do it with Force"
"They lied. There were no cookies." That should get you started. I guess you could also just write your name, or some sort of memorable date, too. It's hard to truly appreciate how cool these are without swinging them around a bit. When you first turn this thing on, a bright green glow shoots upward, traveling from the hilt to tip like a real lightsaber. A thoroughly satisfying 'VUMMMM' sound accompanies this 'power-up' sequence (all sounds are digitally recorded from the movie). When you turn the saber off, the bright glow fades back down the blade, traveling from tip to hilt before disappearing. An equally satisfying "SHHHIOOOOOOHH" sound accompanies the power-down. Once you've had your fill of turning the thing on and off, you can start moving the lightsaber in your hand while it's on -- and suddenly, you're a Jedi. With each swing, the FX Lightsaber hums and whines with scary authenticity. A motion sensor inside the thing can tell when the lightsaber is moving, and lets out the appropriate sound. And, when you're done swinging it, tap the blade against something and listen for the "clash" sound effect. The Force FX Lightsaber features ten motion-sensor-controlled sound effects: power-up, power-down, idle, movement (3 sounds) and clash (4 sounds). Taking this lightsaber out at night and swinging it is one of the most exhilarating things you can do with a Star Wars prop (assuming you are fully clothed). Comes with a cool display stand for the few times this Force FX Saber won't be in your hands.